A 2012 study conducted by the Centers for Disease Control and Prevention found that one out of every two Americans over the age of thirty suffers from gum disease. The study also showed that a staggering 70.1% of adults over the age of 65 suffer from periodontal disease, putting millions of Americans at a higher risk of tooth loss and serious systemic disease, such as diabetes, heart disease, cancer, and osteoporosis. Recent research has found that there is a definitive link between periodontal disease and genetics, which might help individuals to understand and reduce their risk. In fact, studies have shown that kids who have parents with periodontal disease are as much as 12 times more likely to test positive for the bacteria thought to be responsible for periodontal disease. Furthermore, researchers have found that up to 30% of the population falls into the category of being genetically susceptible, which is why everyone should take the time to understand the link between genetics and periodontal disease. Research has shown that things like abnormal tooth structures, malocclusion (crooked teeth), and wisdom teeth that don’t erupt correctly can put a person at a higher risk for periodontal disease. Unfortunately, since you can inherit all of these traits from your parents, these risk factors need to be addressed by dental professionals, such as the Arizona Periodontal Group. Your periodontist can remove impacted molars, suggest ways to correct the alignment of your teeth, and even reshape your dental structures to keep food particles and bacteria from collecting on your teeth. Research has also shown that carriers of the IL-1 Genotype are as much as 20 times more likely to develop advanced periodontal disease than people who don’t have this genetic trait. The IL-1 Genotype is a cytokine involved in the inflammatory response. Patients with this genotype are more prone to have inflammatory reactions than people without the trait, which can also increase their chances of other systemic illnesses, such as heart disease. Fortunately, new tests can check for this genetic marker to help patients understand their level of personal risk. 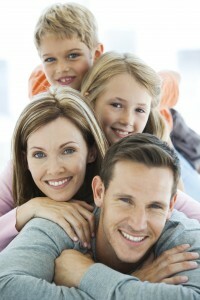 Parents can pass on more periodontal risk factors than just the IL-1 Genotype. Since family members tend to visit the same dentist, enjoy meals together, and pick up one another’s bad habits, your home environment can also put you at a higher risk for periodontitis. For example, research has shown that eating foods that are higher in sugar and certain acids can prompt bacterial growth and gum disease. This means that if you grew up eating a diet that is high in sugar, you might be more prone to periodontal disease. Also, since adults who had parents who drank and smoked when they were younger are also more likely to drink and smoke themselves, these lifestyle choices can translate into gum disease, which can morph into periodontal disease. Research has also shown that poorly contoured dental restorations, such as fillings and crowns, can trap food particles that can act as a breeding ground for bacteria and cause periodontal disease. This means that if you go to the same family practice that your parents went to for years, and you haven’t been receiving top-level care, you could be at a higher risk for periodontal disease. For more information about your personal risk factor for periodontal disease, make an appointment with Dr. Trujillo at the Arizona Periodontal Group.